1) Internet users in the world are more than 3,137,721,520. The number is increasing with a high pace of approx. 8 users per second and 480 users per minute. 2) Total number of Websites over the internet is 952,518,350+ and the count is increasing with a speed of 5+ websites per second contributing to 320 websites per minute. 3) Around 40% of the world population has an internet connection today. In 1995, it was less than 1%. 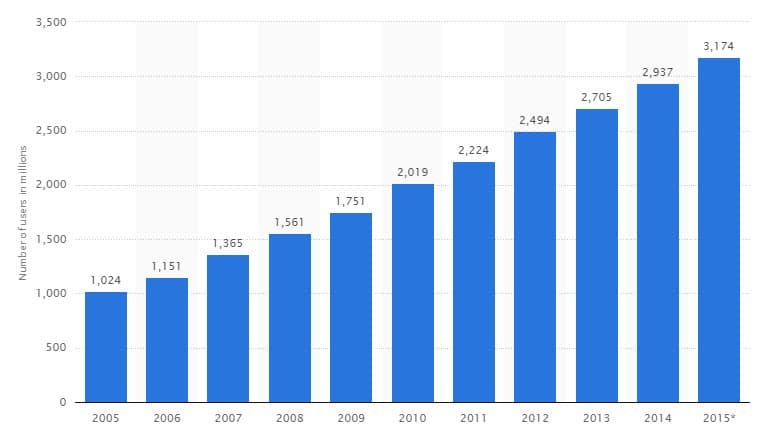 4) The number of internet users has increased tenfold from 1999 to 2013. 5) The first billion count of internet users reached in 2005. The second billion in 2010 and the third billion in 2014. 6) The first ever website (info.cern.ch) was published on August 6, 1991 by British physicist Tim BernersLee while at CERN, in Switzerland. On April 30, 1993 CERN made World Wide Web (WWW) technology available on a royaltyfree basis to the public domain, allowing the web to flourish. 7) Facebook active users count is over 1,419,730,982 and is increasing with a pace of 330 users per minute. 8) Google+ active users count is over 1,146,250,592 and is increasing with a pace of 1840 users per minute. 9) Twitter active users 310,373,000 and is increasing with a pace of 126 users per minute. 10) Pinterest active users 73,326,000 and is increasing with a pace of 90 users per minute. 11) Number of blog post published each day is over 4 crores and is running with a pace of 480 blogs per second. 12) 2,400,136 emails are sent in 1 second. 13) 67% of the emails sent are spam. 14) 9,332Tweets are sent in 1 second. 15) 2,177Instagram photos are uploaded in 1 second. 16) 1,978 Tumblr posts are posted in 1 second. 17) 1,768 Skype calls are done in 1 second. 18) 27,825 GB of Internet traffic is used in 1 second. 19) 49,114 Google searches are conducted in 1 second. 20) 101,946 YouTube videos are viewed in 1 second. [su_box title=”More From DSIM :-” box_color=”#c7c7c7″ title_color=”#000000″]1) Top 5 budwieser video ads, which one’s your favorite?